We are pleased to announce that we will be holding our International Karate Seminar with Hanshi Kazuyuki Hasegawa(9th Dan) President of the Kyokushinkaikan World Sokyokushin and his student Sensei Takuma Kouketsu, Twice World Champion in 2008 and 2012 and several times All-Japan Champion. We are announcing this event early to give everyone the opportunity to attend and to avoid clashing with other Kyokushin Karate events. The seminar will be held from Friday the 10th of June 2016 until Sunday the 12th of June. The venue is The University of Stirling in Scotland, United Kingdom. The University accommodation, flats offer apartment-style accommodation comprising, five person flats with five single bedrooms. There are only 50 places available so please book soon. The seminar fee will be £165 and a non-refundable deposit of £50 secures your place. For anyone who pays in full before March 1st 2016 we are offering a reduced early bird fee of £145.This fee includes your accommodation, breakfast, lunch and dinner. 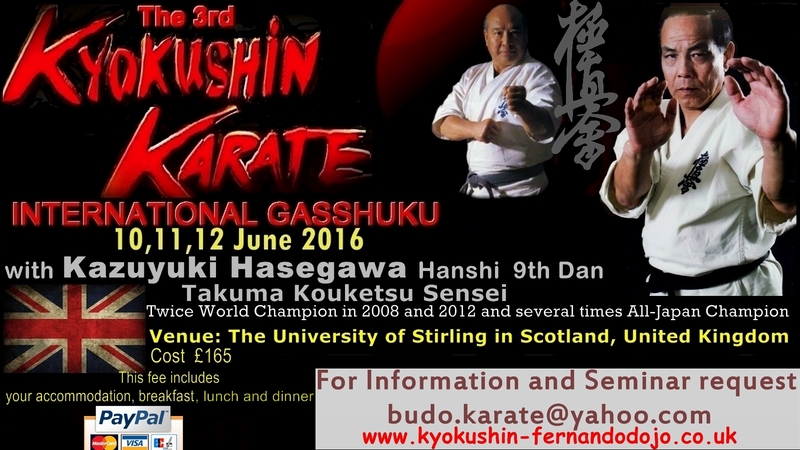 We will hold Kyu and Dan grading under Hanshi Kazuyuki Hasegawa, please contact if you are interested. Please get in touch with me if you have any questions. I hope to see you in Stirling next year.